This tutorial will take you through a complete attack on an encrypted bootloader using AES-256. 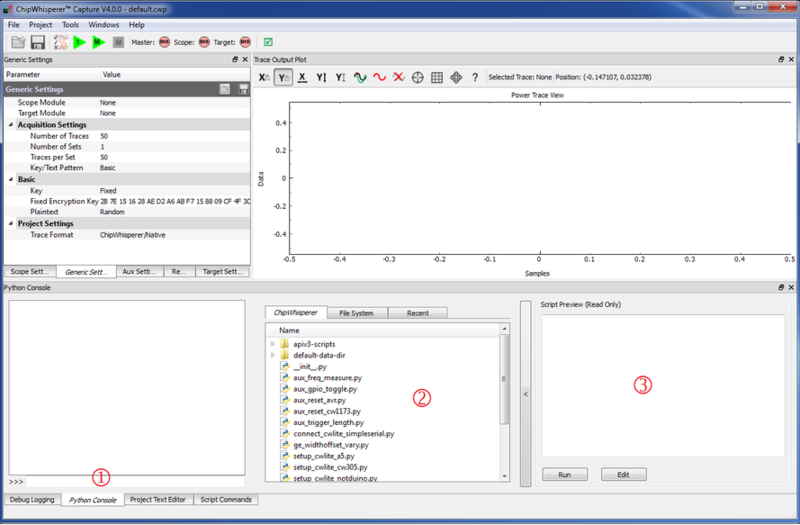 This demonstrates how to using side-channel power analysis on practical systems, along with discussing how to perform analysis with custom scripts. Whilst the tutorial assumes you will be performing the entire capture of traces along with the attack, it is possible to download the traces if you don't have the hardware, in which case skip section #Setting up the Hardware and #Capturing the Traces. In the world of microcontrollers, a bootloader is a special piece of firmware that is made to let the user upload new programs into memory. This is especially useful for devices with complex code that may need to be patched or otherwise updated in the future - a bootloader makes it possible for the user to upload a patched version of the firmware onto the micro. The bootloader receives information from a communication line (a USB port, serial port, ethernet port, WiFi connection, etc...) and stores this data into program memory. 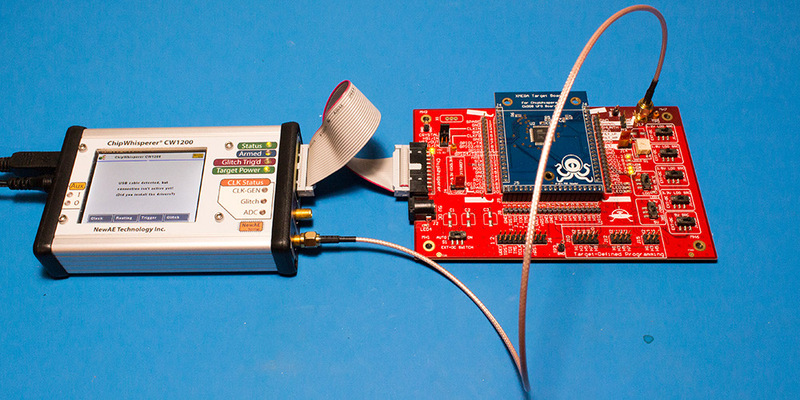 Once the full firmware has been received, the micro can happily run its updated code. There is one big security issue to worry about with bootloaders. A company may want to stop their customers from writing their own firmware and uploading it onto the micro. For example, this might be for protection reasons - hackers might be able to access parts of the device that weren't meant to be accessed. One way of stopping this is to add encryption. The company can add their own secret signature to the firmware code and encrypt it with a secret key. 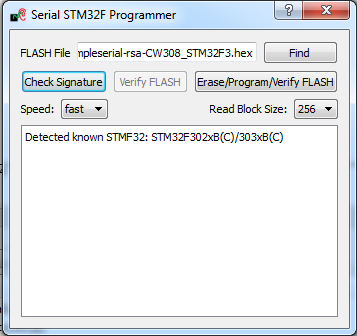 Then, the bootloader can decrypt the incoming firmware and confirm that the incoming firmware is correctly signed. Users will not know the secret key or the signature tied to the firmware, so they won't be able to "fake" their own. 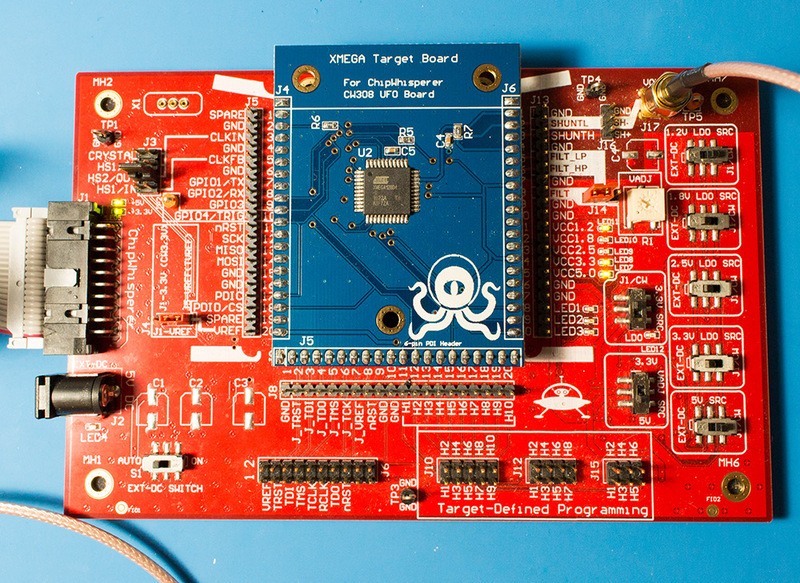 This tutorial will work with a simple AES-256 bootloader. The victim will receive data through a serial connection, decrypt the command, and confirm that the included signature is correct. Then, it will only save the code into memory if the signature check succeeded. To make this system more robust against attacks, the bootloader will use cipher-block chaining (CBC mode). Our goal is to find the secret key and the CBC initialization vector so that we could successfully fake our own firmware. The bootloader's communications protocol operates over a serial port at 38400 baud rate. The bootloader is always waiting for new data to be sent in this example; in real life one would typically force the bootloader to enter through a command sequence. Signature: A secret 4 byte constant. The bootloader will confirm that this signature is correct after decrypting the frame. Data: 12 bytes of the incoming firmware. This system forces us to send the code 12 bytes at a time; more complete bootloaders may allow longer variable-length frames. CRC-16: A 16-bit checksum using the CRC-CCITT polynomial (0x1021). The LSB of the CRC is sent first, followed by the MSB. The bootloader will reply over the serial port, describing whether or not this CRC check was valid. As described in the diagram, the 16 byte block is not sent as plaintext. Instead, it is encrypted using AES-256 in CBC mode. This encryption method will be described in the next section. Then, after replying to the command, the bootloader veries that the signature is correct. If it matches the expected manufacturer's signature, the 12 bytes of data will be written to flash memory. Otherwise, the data is discarded. The system uses the AES algorithm in Cipher Block Chaining (CBC) mode. In general one avoids using encryption 'as-is' (i.e. Electronic Code Book), since it means any piece of plaintext always maps to the same piece of ciphertext. Cipher Block Chaining ensures that if you encrypted the same thing a bunch of times it would always encrypt to a new piece of ciphertext. This diagram shows that the output of the decryption is no longer used directly as the plaintext. Instead, the output is XORed with a 16 byte mask, which is usually taken from the previous ciphertext. Also, the first decryption block has no previous ciphertext to use, so a secret initialization vector (IV) is used instead. If we are going to decrypt the entire ciphertext (including block 0) or correctly generate our own ciphertext, we'll need to find this IV along with the AES key. The system in this tutorial uses AES-256 encryption, which has a 256 bit (32 byte) key - twice as large as the 16 byte key we've attacked in previous tutorials. This means that our regular AES-128 CPA attacks won't quite work. 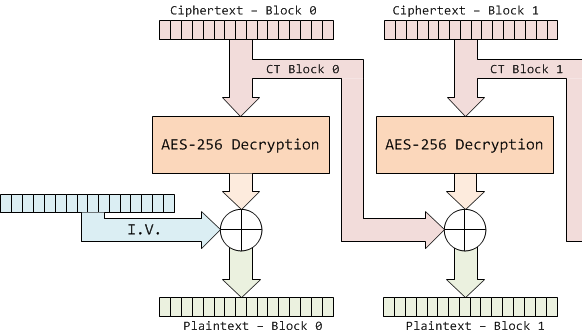 However, extending these attacks to AES-256 is fairly straightforward: the theory is explained in detail in Extending AES-128 Attacks to AES-256. Perform a standard attack (as in AES-128 decryption) to determine the first 16 bytes of the key, corresponding to the 14th round encryption key. Using the known 14th round key, calculate the hypothetical outputs of each S-Box from the 13th round using the ciphertext processed by the 14th round, and determine the 16 bytes of the 13th round key manipulated by inverse MixColumns. Perform the MixColumns and ShiftRows operation on the hypothetical key determined above, recovering the 13th round key. 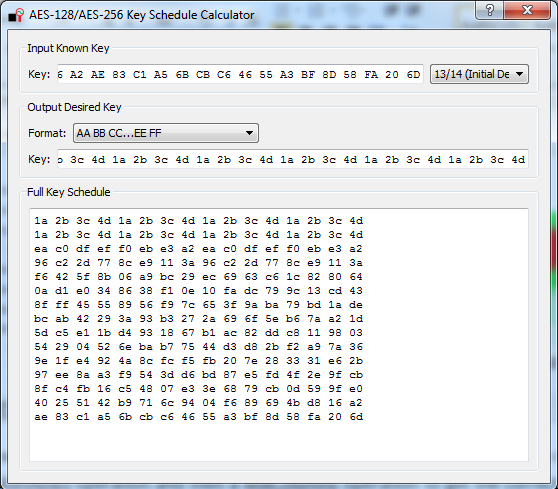 Using the AES-256 key schedule, reverse the 13th and 14th round keys to determine the original AES-256 encryption key. Are you following this tutorial at a training event? If so ONLY use the provided hex-file with secret key already embedded, do not rebuild the firmware! 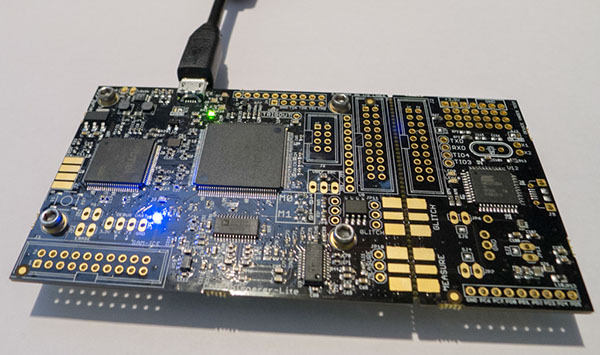 For this example, we'll be using the bootloader-aes256 project. Note that you don't need hardware to complete the tutorial. 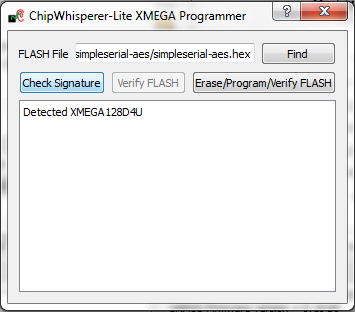 Instead, you can download example traces from the ChipWhisperer Site. 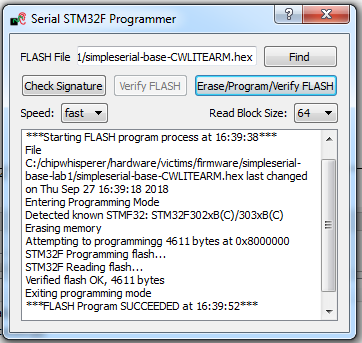 Just look for the traces titled AVR: AES256 Bootloader (ChipWhisperer Tutorial #A5). 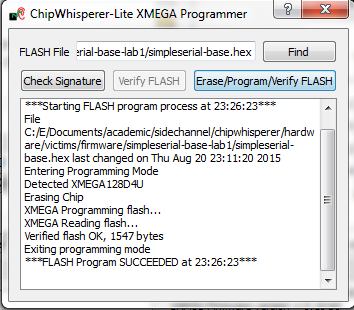 Once the hardware is ready, we can capture some traces for our attack using the ChipWhisperer Capture software. If you somehow got to the 5th Advanced Tutorial without getting this software ready, you can follow the helpful guide at Installing ChipWhisperer. 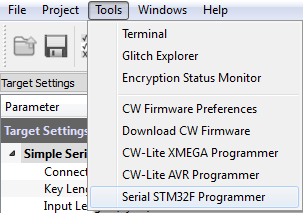 Your computer should have a folder called chipwhisperer_projects - if you don't know where this is, the File > Preferences window will tell you. The system looks in the folder chipwhisperer_projects\chipwhisperer\capture\targets for new targets, so you can save your file here. 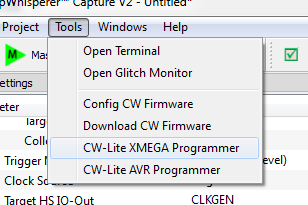 Alternatively, all of the normal targets are stored in chipwhisperer\software\chipwhisperer\capture\targets, so you can also save the file here. Note that this may not be possible if you don't have access to these folders (ex: your account doesn't have admin access). it loads all of the hardware parameters for us. Nice! Run the capture script, which will open a ChipWhisperer Capture window with everything connected for us. Open the terminal (Tools > Terminal) and connect to the board. While the terminal is open, press the Capture 1 button. A single byte of data should appear in the terminal. This byte will either be a1 (CRC failed) or a4 (CRC OK). If you see any other responses, something is wrong. Once you're happy with this, open the General Settings tab and set the Number of Traces. 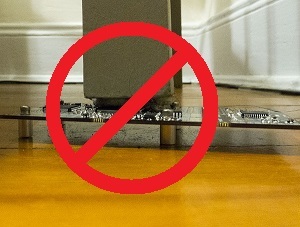 You should need around 100 traces to break AES. Press the Capture Many button to record the 100 traces. You'll see the new traces plotted on-screen. Once the program is finished capturing the traces, save the project. Put it somewhere memorable and give it a nice name. Now that we have our traces, we can go ahead and perform the attack. As described in the background theory, we'll have to do two attacks - one to get the 14th round key, and another (using the first result) to get the 13th round key. Then, we'll do some post-processing to finally get the 256 bit encryption key. 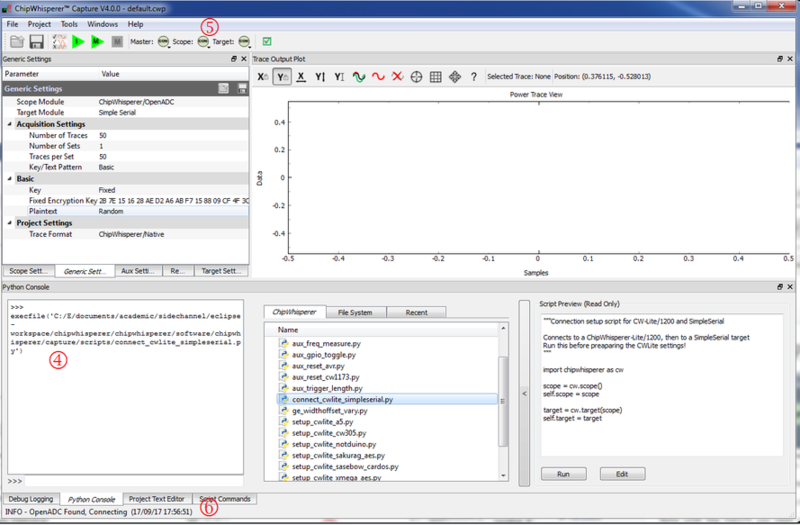 Open the ChipWhisperer Analyzer program and load the .cwp file with the 13th and 14th round traces. This can be either the aes256_round1413_key0_100.cwp file downloaded or the capture you performed. Notice that the traces are synchronized for the first 7000 samples (if you're attacking an XMEGA target), but become unsynchronized later. This fact will be important later in the tutorial. If you're finding the attack very slow, narrow down the attack a bit. Normally, this requires a bit of investigation to determine which ranges of the trace are important. Here, you can use the range from 2900 to 4200 for XMEGA and from 1400 to 2600 for STM32F3 (CW303 Arm). The default settings will also work fine, so if you're using another target, you may want to attack the full range. To narrow the attack, edit the attack.setPointRange(0, -1) with the new range. Note that we do not know the secret encryption key, so we cannot highlight the correct key automatically. If you want to fix this, the Results settings tab has a Highlighted Key setting. Change this to Override mode and enter the key ea 79 79 20 c8 71 44 7d 46 62 5f 51 85 c1 3b cb. Finally, run the attack by switching to the Results Table tab and then hitting the Run button while your script is selected. The default capture stores the WRONG knownkey, so you will have highlighted bytes that are not the correct key. We are looking instead for a large delta between the best-guess and all other guesses. For example for Byte 0 we have the most likely as 0.8141, and 2nd best guess as 0.3551. If our best guess was 0.8141 and 2nd best guess was 0.7981 this would indicate we likely haven't broken the key. In any case, we've determined that the correct 14th round key is ea 79 79 20 c8 71 44 7d 46 62 5f 51 85 c1 3b cb. NOTE: if you're stuck, a full listing of the attack script is given in #Appendix C: AES-256 14th Round Key Script. Unfortunately, we cannot use the GUI to attack the 13th round key. The system has no built-in model for round 13 of the AES-256 algorithm. Instead, we can write our own script and insert a custom model into the system. See #Appendix D: AES-256 13th Round Key Script for complete script used here. 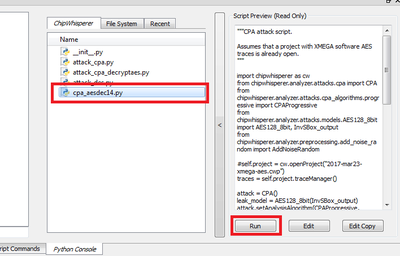 Open the ChipWhisperer Analyzer software again and reopen the project file (if closed). 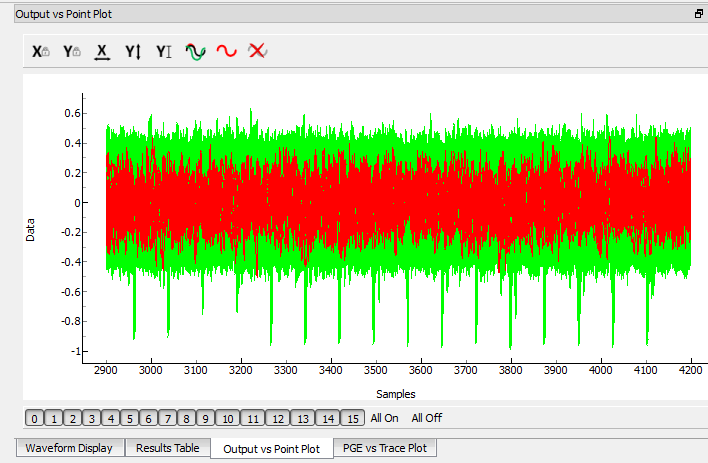 Make sure you get a nice aligned last section of the traces, as in the below figure. You may need to adjust the "input window" or "reference points" slightly. If you do not see the nice alignment the remaining attack will fail! #You must but YOUR recovered 14th round key here - this example may not be accurate! You can look back at the C code of the AES-256 decryption to see how this is implementing the decryption code. Note that because of the Inverse MixColumns operation, we need the entire input ciphertext -- otherwise, we would only need to operate on one byte of the ciphertext. Add the above function to your custom script file. Note you can check #Appendix C AES-256 13th Round Key Script for the complete contents of the attack script. Our hard work has rewarded us with the 13th round key, which is c6 6a a6 12 4a ba 4d 04 4a 22 03 54 5b 28 0e 63. Finally, we have enough information to recover the initial encryption key. In AES-256, the initial key is used in the key expansion routine to generate 15 round keys, and we know the key for round 13 and 14. All we need to do now is reverse the key scheduling algorithm to calculate the 0/1 Round Key from the 13/14 Round Key. Peek into supersecret.h, confirm that this is the right key, and celebrate! If you want to go further with this tutorial, Tutorial A5-Bonus Breaking AES-256 Bootloader continues working with the same firmware to find the remaining secrets in the bootloader (the IV and the signature). #    This file is part of chipwhisperer. #    along with chipwhisperer. If not, see <http://www.gnu.org/licenses/>. A base class for CRC routines. return the non-direct init if the direct algorithm has been selected. # If the input data is a string, convert to bytes.
""" Set key length in BITS """
""" Return key length in BYTES """